Look closely. Here's a Royal Enfield motorcycle you can pedal like a bicycle. Page 140 of Roy Bacon's book "Royal Enfield, The Postwar Models," carries a photo of what surely must be one of the most unique Royal Enfield motorcycles ever produced. That is, providing it was ever produced at all. The Internet has not enlightened me any further on it. Was it just a prototype? 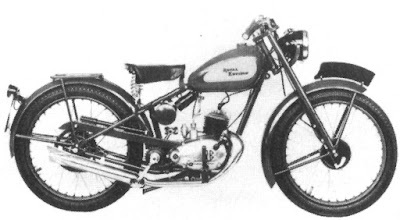 Bacon describes the motorcycle in the photo as "Special RE2 with pedals, folding footrests and altered bars for Bermuda. About 1951-'52." Pedals!? Yes, pedals. They're visible in the photo, fitting neatly behind the unit motor of the little two-stroke Royal Enfield. You also see the separate sprocket the pedals turn. Before the invention of the kickstarter, pedaling presumably was how these motorcycles started their motors. Jorge tracked the first patented kickstarter to 1909. But pedals on a Royal Enfield in 1951? Did Bermuda have regulations giving mopeds a big tax break? Were true motorcycles outlawed? What other reasons could there be for such a model? Bacon's book offers no further explanation. But it's apparent from the photo that this was no easy modification. Remember, it wasn't just the pedal cranks that would have to clear parts of the motorcycle as they swung around. The pedal pusher's shoes extend out from the pedals, too. Clearly, the folding footrests were essential. The kick start lever is not shown (although you see where it attaches). Perhaps the lever would ride in the tool box when not in use. I suppose the rider could always start the little 125cc machine just by pedaling forward. I realize that pumping around on a moped isn't practical for any distance, and the seat height shown in the photo would have made that a very trying experience. But wouldn't it be great to have a "limp home" option? There have been times when I've fantasized about it.